"...The necessity for sweeping immigration reform is illustrated in Lynn E. Letterman’s A Two-sided Border Story (2008). Here illegal and legal immigration are shown as branches growing on separate sides of the same tree. The family in Poli Marichal’s Vigilia (2008) could well represent the risks of illegal immigration, or the left side of the tree, while Carol Nye’s portrait of a successful middleclass woman in From the series “Chinese American Women of Los Angeles”: Lilly L. Chen (1996) personifies the positive aspects of immigration." "Where Lippenberger addresses men's relationship to society in general, on the other side of the Artworks in the "short hall," Lynn Elliott Letterman's Tree of Art examines women's place in the world of postmodern art. Letterman started on the 6-foot-by-7-foot piece in the mid-1990s after working as a docent in the Walker Art Center in Minneapolis and studying contemporary art in depth. Through her studies she came to notice that women didn't gain serious recognition as artists until the later part of the 20th century. The Tree of Art, which lists the names of major artists on leaves hanging off branches labeled after artistic movements such as "post-animation" and "pluralism," shows the increased recognition of female artists through the years. A similar piece, as yet uncompleted, explores various cultural representations of Eve, with apples and branches of a tree featuring Biblical and literary quotes about her role in history and in shaping humankind. 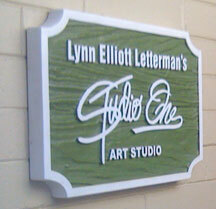 Letterman, who has had a studio at the Artworks for six years, explains that despite the variety of artists currently working there, the sense of community is significant. "We're all very together here," she says. "And we all respect each other's work. If we're working on a piece of artwork and we're stuck, we can't seem to get through to the middle of it, we'll ask another artist, 'What do you think? Does this look right? Does it need something?' All of us are so creative that we can give advice on what might look good or how to handle something."